In the previous post, I went to Mui Ngo Gai to experience Vietnamese cuisine beyond Pho. This time to escape the grip of Pho, I went to Mr. Red Cafe for food from the city of Hanoi and in general Northern Vietnam. I didn’t realize that most of the Vietnamese food served in the Lower Mainland has its origins from South Vietnam and is Saigon centric. 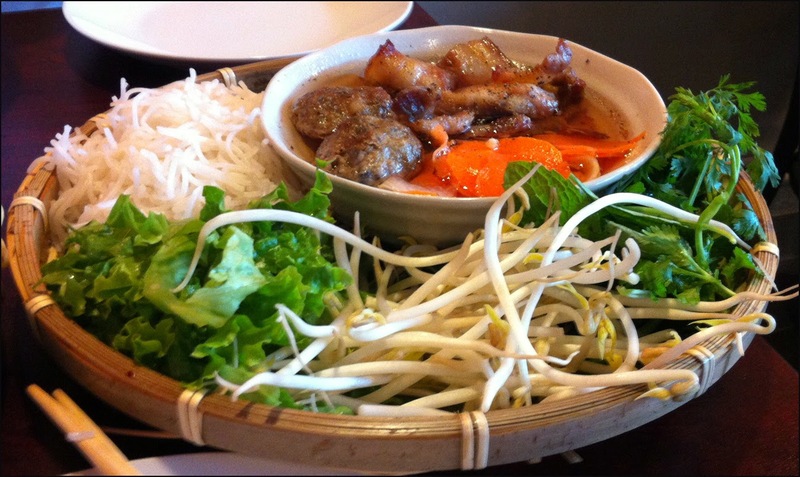 I was very curious about the different dishes I would see and how Northern Vietnamese cuisine would differ. First off, Mr. Red is a family run business with Rose manning the dining area and her husband working the magic in the kitchen. Rose is the friendly face of Mr. Red. She is super charming and very knowledgeable about the food they serve. On my first visit, I ordered the Bun Cha and Crab Spring Rolls. 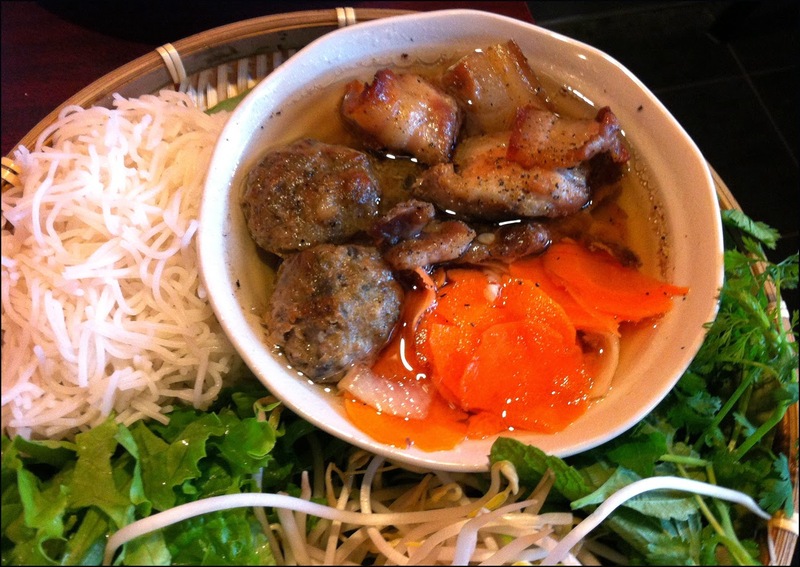 Bun Cha is a very popular street food from Hanoi. 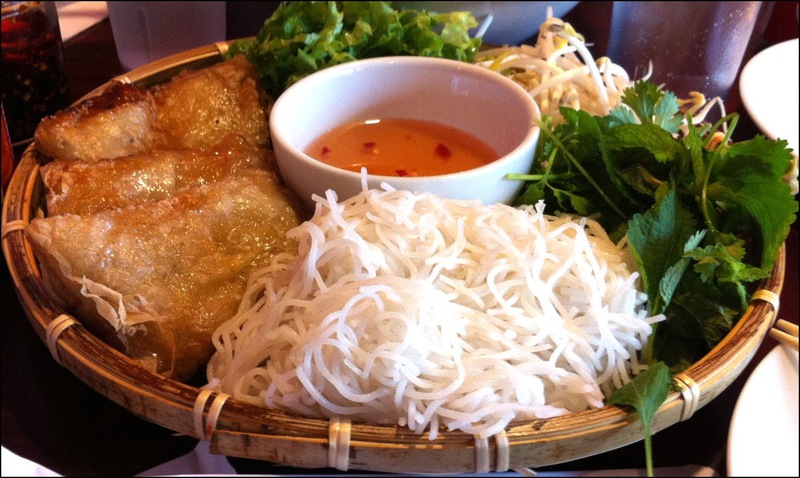 It’s grilled pork patties in, I think Nuoc Cham, dipping sauce served with herbs and rice noodles. You eat the noodles by dipping them in to the sauce. At Mr. Red, in addition to the grilled pork patties, there are slices of grilled porky belly, carrots and papaya. I was very leery of the dipping sauce as I find most Nuoc Cham have an overwhelming sweetness that I’m not fond of. However at Mr. Red, the sauce was actually very balanced. I was able to detect other components of the sauce like the fish sauce. Much like southern fare, this dish came loaded with fresh herbs. There was more variety in the herbs as lemon balm was included as well. The pork patties had a nice soft texture. Both patties and the pork belly had a grilled s taste. This dish was simple and substantial but not heavy; a winner in my books. I was excited to try the Crab Spring Rolls since I have never seen it on any Vietnamese menus before. When they arrived I realized I made a mistake and ordered the entrée version instead of the appetizer. The 3 rectangular spring rolls came with all the herbs and noodles that came with the Bun Cha. 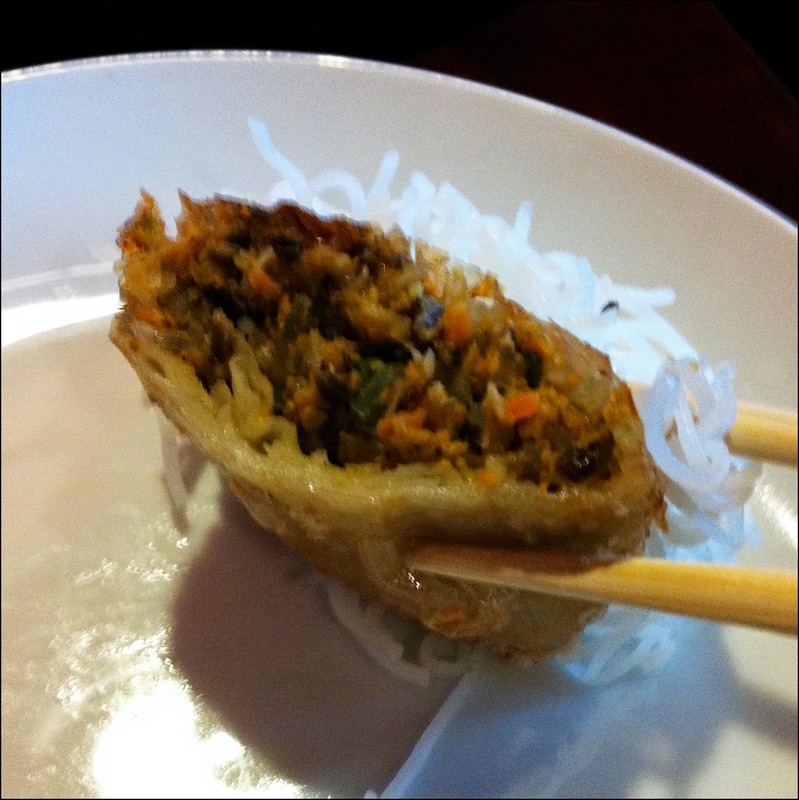 The spring rolls were filled with crab, carrots, wood ear fungus, and glass noodle. The filling was very soft and flavourful. I was curious about the wrapper they used, as it was different than the rice wrappers that are normally deployed in Vietnamese spring rolls; there was no pocking. It was thin and crispy. I was impressed with my meal and returned a few weeks later to try two more non-Pho items at Mr. Red. I ordered the pyramid dumpling and the Sticky Rice with Chicken. According to Rose, only a dozen or so pyramid dumplings are made daily. Well this dumpling won’t win any beauty contests, as it looks like a big blob. However this thing was delicious. 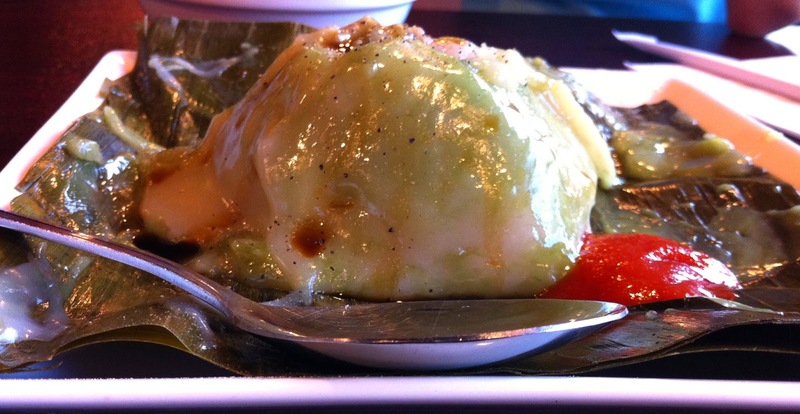 It’s served unwrapped, but the glutinous dumpling wrapper did leave its mark, imparting its distinct green colour. I was expecting the gummy wrapper to be sweet or have a raw flour taste like mochi but it had not only absorbed the flavour of the wrapper but also the meaty filling; making the outer dough tastier than expected. The filling mainly consisted of a savoury cooked ground meat (probably pork) in a thin gravy. There was a surprise in the form of a quail’s egg. This dumpling reminded me of a healthier steamed version of the dim sum staple, deep fried pork dumpling (Ham Sui Gok). Despite its appearance I enjoyed this unique dumpling. The last non-Pho item I tried at Mr. Red was the Sticky Rice with Chicken. This dish is complex and an umami explosion. 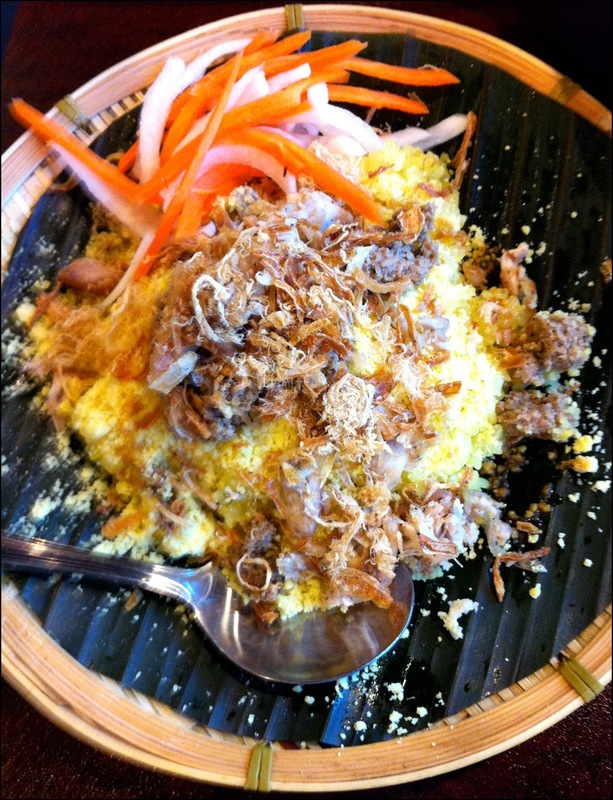 The turmeric stained sweetish rice is topped with powdered earthy mung bean, shreds of chicken, fragrant fried shallots and the impressively rich and salty in-house made pate. The pate is wonderful and boldly stands out, making it the star of the dish. Each bite of the sticky rice had different texture and tastes, making this simple dish more complicated. To help balance out the heaviness of the sticky rice, pickled daikon and carrot slivers are provided. 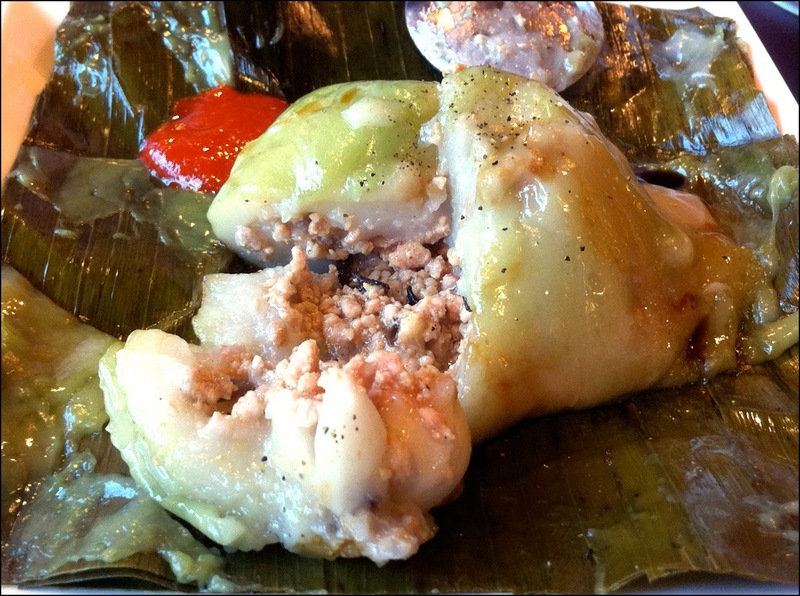 The sticky rice with chicken is unique and a wonderful must try. Based on the food I tried, the only difference I noticed about Northern Vietnamese cuisine is it seems more subtle than its southern counterpart. I found the flavours at Mr. Red more balanced, creating a harmonious eating experience instead of the more bold and in your face tastes, in particular sweetness, of Vietnamese food I have had in the city. Mr. Red Cafe is a charming and great family run restaurant offering tasty variety to the Vietnamese food scene in Vancouver. It’s a gem in an East Van neighbourhood fast becoming a must go to place for fabulous but unfussy food.